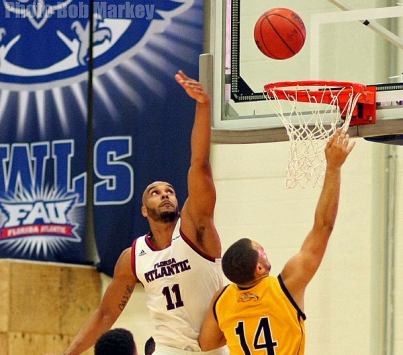 The Florida Atlantic University men's basketball team rode an impressive second half performance to a 74-49 win over Warner on Monday night. A lackluster first half performance from the Owls (1-1) gave them just a 33-29 lead at the break. However, a 20-4 run to start the second half gave FAU a 53-33 lead with 10 minutes to go in the game. "If we play like we did in the second half, our fans will enjoy coming to watch us", said Head Coach Michael Curry, who earned his first official win with the Owls and at the collegiate level. The advantage grew as large as 29, as the Owls used their superior size to stifle the Royals. FAU outscored Warner 41-20 in the second stanza and shot 54.2 percent from the floor in the period. Justin Raffington (pictured) had 15 points and 11 rebounds for his 10th career double-double, while being largely responsible for the surge. "Coach drew up a play that we were running like five times in a row where I got the ball on the block" Raffington said during his post game interview. "I think that's what triggered it". He was joined in double figures by Jackson Trapp (13) and Justin Massey (12). Kelvin Penn chipped in four points, five rebounds and four blocked shots. The Owls will play at Harvard on Thursday night. Tip-off is set for 8 p.m. and the game will air on the American Sports Network.